1.1. This specification provides the minimum requirements for the design, performance data, and testing of rubber expansion joints. It also establishes the minimum criteria for the manufacturer’s credentials and experience. 2.1. Rubber expansion joints can be used to relieve thermal stresses in rigid piping systems by absorbing axial movements with minimal resistance. Rigid piping systems will continuously restrain the pressure thrust force by using main anchors with multiple guides at specific spacing. Lateral movements can also be achieved with the use of a directional main anchor. In these systems, control units can be installed as limit rods to provide secondary pressure restraint. When the support structure and/or adjacent equipment have load limitations, control units can be installed as tie rods to continuously restrain the pressure thrust force. 2.2. Rubber expansion joints will also provide all directional movement, such as axial, angular, lateral, and torsional, that may occur from external conditions. External conditions include, but are not limited to ground settlement, wind and shock loading, and seismic events. The rubber expansion joints will have a cycle life in the tens of millions while effectively reducing noise and vibration, as well as compensating for pipe misalignment. 2.3. Rubber expansion joints, via their removal, will provide access to piping and equipment as long as a self-retracting design is not required. 4.1. Submit product literature that illustrates the rubber expansion joint’s design, materials, performance, and dimensional characteristics as well as the qualifications of the manufacturer. 4.2. Upon request, provide submittal drawings that clearly identify the rubber expansion joint’s dimensions including all supplied accessories. Information will also include materials of construction, pressure and temperature ratings, as well as movements and spring-rates for piping analysis and other purposes. 4.3. Upon request, provide a 2-D and/or 3-D scaled solid model to verify clearance and/or for customer pipe modeling. 4.4. Upon request a certificate of conformance and/or calculations shall be provided to verify the appropriate codes and/or customer requirements are met. Calculations shall be stamped by a licensed engineer employed by the manufacturer. 4.5. Upon request submit the installation & maintenance instructions. 5.1. The rubber expansion joint shall have a single or multiple wide flowing arch. This profile provides exceptional all directional movement while virtually eliminating sediment buildup. 5.2. The inner tube shall be a seamless, leak-proof layer of nominal ¼” thickness that extends from the outside diameter of one flange to the outside diameter of the other flange. It shall be an elastomer compatible with the fluid media and service temperature. 5.3. The textile reinforcement shall be a minimum of six bias plies of high quality tire-cord reinforcement, having an adhesion promoting resorcinol formaldehyde latex (RFL) coating and impregnated (skimmed) with a compatible elastomer to ensure a homogeneous bonding to other layers. 5.4. The metal reinforcement shall have sufficient radial strength to support the textile loads. It shall be high-tensile steel to keep weight and volume down to optimize flexibility. The metal reinforcement shall be round to prevent cutting of the textile reinforcement. 5.5. The exterior cover shall be a seamless layer, of nominal 1/16" thickness. It shall be an elastomer compatible with the external environment. 5.6. When required an additional exterior coating shall be applied to improve the external weathering protection. 5.7. Rubber flanges shall be integral with the body and have a full flat face with the same outside diameter as the mating flange. Flanges shall be drilled to Class 150 lb., or as specified. 5.8. Retaining rings shall be fabricated of minimum 3/8" thickness high grade carbon steel or ductile iron with hot dipped galvanized finish. Alternative materials and finishes are available upon request. 5.9. Control Units, when installed as limit rods, are designed to restrict the rubber expansion joints movement range (axial, angular, lateral, and torsional) during normal operation. In the event of main anchor failure, the limits rods will engage and function as a secondary restraint. This will prevent the rubber expansion joints from over-extension or over-compression, by restraining the full pressure thrust loads. Control units, when installed as tie rods, are designed to restrain the expansion joints axially while restricting their other movements (angular, lateral and torsional) during normal operation. The tie rods will act as the piping system’s primary restraint by continuously restraining the full pressure thrust loads. The control units will be designed based on the rubber expansion joint’s calculated thrust force at the specified pressure. The gusset plates shall be high grade carbon steel with hot dipped galvanized finish and the rods shall be high strength ASTM A193, Grade B7 with hot dipped galvanized finish. Alternative materials and finishes are available upon request. 5.10. When required, optional shield covers shall be used as additional protection against direct sunlight UV rays as well as other adverse environmental conditions. 5.11. Identification and markings shall include manufacturer’s name, manufactured date, maximum allowable working pressure and temperature, nominal diameter, face-to-face dimension, materials of construction, and a traceable serial number. These identification markings when requested shall be permanently attached to the expansion joint. 6.1. Style 1101 reflects a single arch rubber expansion joint with design pressures shown below and a full vacuum rating. Style 1102, 1103, 1104 reflects double, triple, and quadruple arch designs respectively, with the same design pressures as a Style 1101, but with reduced vacuum ratings. When full vacuum ratings for multiple arch rubber expansion joints are required, substitute Style 1202 for Style 1102, Style 1203 for Style 1103, and Style 1204 for Style 1104 respectively. 6.2. All expansion joints shall have a minimum burst pressure of three times the design pressure. The design shall be substantiated by detailed stress analysis such as the finite element method or other sound engineering practice. Additionally, the design should have successful service experience under comparable conditions for similar components of the same or like material. 6.3. Hydrostatic pressure test shall be performed at 1-1/2 times the design pressure. Full vacuum tests shall be performed at 26” hg due to site elevation and equipment limitations. The duration of each of these tests shall be 10 minutes unless otherwise specified. These non-destructive tests can be witnessed by the customer or authorized third party when ordered. Higher design pressures are available upon request. 6.4. 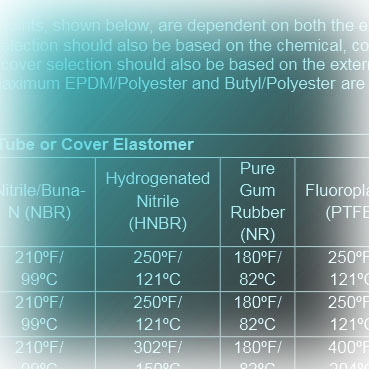 Rated temperatures for rubber expansion joints are dependent on both the elastomer and reinforcement limitations. The tube selection should also be based on the chemical, corrosive, and/or abrasive nature of the media. The cover selection should also be based on the external environment. For air service at 25 psig maximum EPDM/Polyester and Butyl/Polyester are rated for 300ºF. See PDF for temperature ratings. 7.1. Manufacturer shall upon request prepare a detailed inspection and test plan for approval. The test plan shall include test details, frequency, acceptance criteria, and applicable codes and standards. Hold points and review of documentation can be witnessed by the customer and/or authorized third party when ordered. 7.2. Visual and dimensional inspection shall verify that the tolerances are within specified allowable. The tube and cover shall be free of structural defects. Small depressions and indentations are acceptable as long as the surface of the elastomer is not broken. Surface blemishes, such as flash, nylon wrap markings, grooves, and other indentations in the cover are acceptable. 7.3. The American Society for Testing and Materials technical testing standards, ASTM D2240, ASTM D412, ASTM D297, ASTM D471, ASTM D573 and ASTM D395 are to be performed annually on each batch of compound manufactured to assure conformance to the specific ASTM D2000 classification line call outs for each elastomer as listed below. Appropriate documents shall be available to the customer upon request. 7.4. Hydrostatic & Vacuum Testing - Manufacturer shall be capable of performing hydrostatic testing in-house, allowing the end user to witness said test when required. When testing for full vacuum the maximum test pressure, due to facility and equipment limitations, shall be 26” Hg. 8.1. Manufacturer shall have at least ten (10) years experience in the manufacture of rubber expansion joints, and shall provide references and an experience list upon request. 8.2. Manufacturer shall be ISO 9001 certified. 8.3. Manufacturer shall be ISO 14001 certified. 8.4. Manufacturer shall be a member of the Fluid Sealing Association. 8.5. Manufacturer shall be capable of providing on-site services including field measurement, visual inspection of existing products in service, evaluation of piping misalignment to determine build dimensions for offset expansion joints, training seminars, and technical assistance during installation upon request. 8.6. All Expansion Joints shall be Series 1100 as manufactured by the General Rubber Corporation of Carlstadt, NJ 07072 or pre-approved equal.